Verdon Gorges by boat ! Since 2000, Verdon Electronautic has been specialized in license free boat rentals. You can choose from 20 electric boats welcoming from 2 to 8 people without any age limit. Their maximal speed is 8km/h and can last for 4 hours at full power. Enjoy a safe family trip that will last forever in your kids minds ! VDo you want to enjoy unique and wild landscape during your river tourism sessions departing from Quinson town? We offer you license free electric boat rentals to visit the Gorges and Esparron’s lake. We are happy to welcome you in our nautical base located Allée des Près du Verdon in the town of Quinson. You can choose among our 20 license free electric boats with capacities from 2 to 8 people for your family and friends rides over 22 kilometers (round trip) of lake and river. Anxious to make you spend a pleasant and relaxing moment, before each departure, we provide you with a quick yet comprehensive training. We take pride in respecting every safety instructions. The safety jackets provided are mandatory on board and a thermal motor boat is close by in case of need. For your cosiness and safety, Verdon Electronautic offers you a range of crafts suiting passengers number and ages (adults, kids with no age restriction and pets allowed on board). Thus, we provide you with 2 to 4 places boats (weight allowance: 400kg), 4 to 6 places boats (weight allowance: 500kg) or 6 to 8 places boats (weight allowance: 700kg). Understand that these allowances include passengers, strollers, backpacks, coolers … and your pets !!! Discover our license free boat rentals in more details. Note that any booking by email cannot be treated. Booking advices for July/August and weekends. 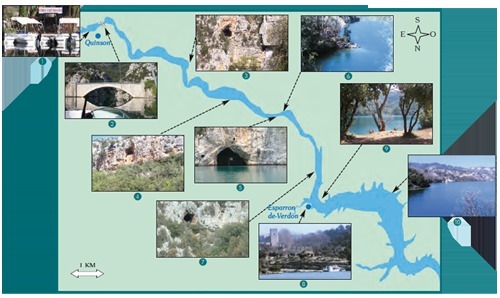 Verdon Gorges is an amazing décor along 22km (round trip) wrought by mother nature. Have a look at the various stages and things not to miss during your river cruise in detail. VIf you want to enjoy license free electric boat rentals with our nautical base, don’t hesitate to refer to our rates or contact us for more information.